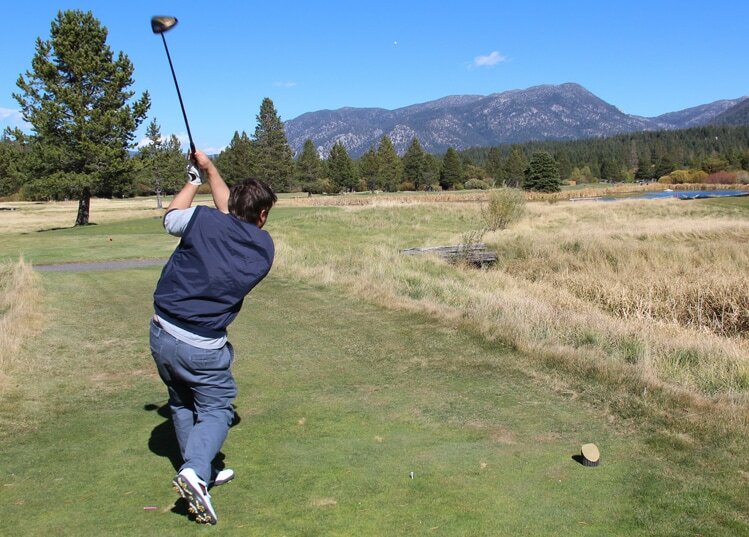 Lake Tahoe Golf Course Hole 3: The first of many par fours on the course that require drives that find their way between the pines on both sides of the fairway. This one has a green that is well guarded by two oval bunkers short of the green on either side of the putting surface. Lake Tahoe Golf Course Hole 6: This par three is challenging as it is over the creek and has even more water to content with to the right of the rather large, but flat putting surface. 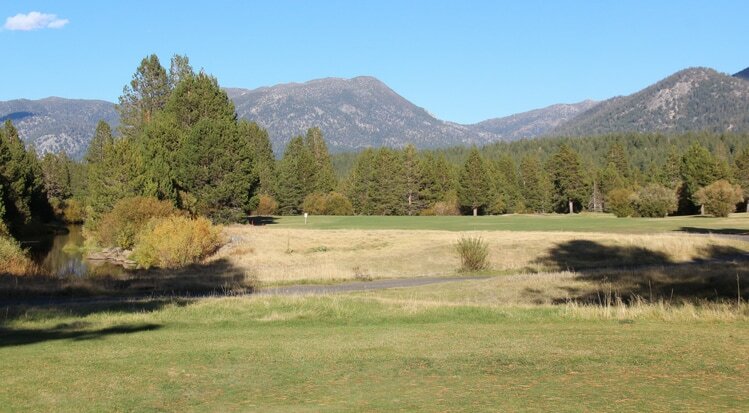 Lake Tahoe Golf Course Hole 8 (left): The tee shot here is from a dark area surrounded by thick trees and looks more daunting than it actually is as the fairway opens up quite a bit but just can't be seen from the tee box on this dogleg right. Going left of the visible area, though, is definitely not a good idea. 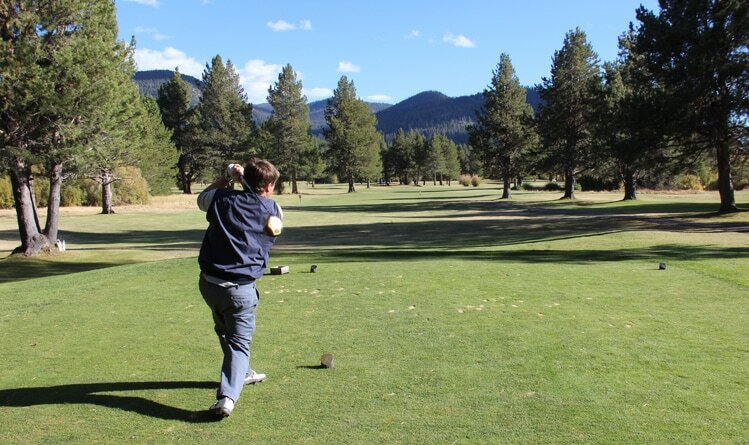 Lake Tahoe Golf Course Hole 9 (below): The finishing hole to the front nine is a par five that is fairly level but has a drive with water down the right side. After the tee shot, the hole gets more simple, so a good straight blast with the driver will leave a decent scoring chance. 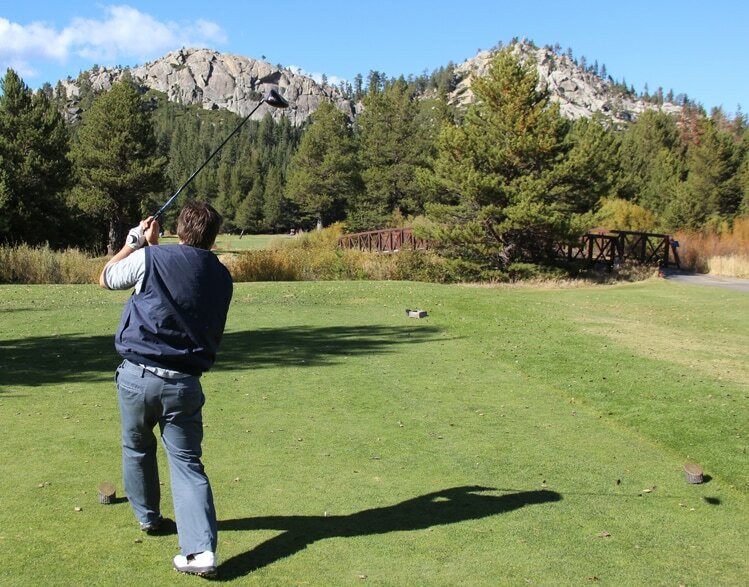 Lake Tahoe Golf Course Hole 10: One of the more interesting par fours on the course, the tee shot is over a creek (not really in play) and heads towards rock outcroppings in the distance. The landing area is quite narrow and going right (can't be seen from tee) is dead meat. The second shot is uphill to a green that is tough to hit and tough to putt, especially back pin placements..
Lake Tahoe Golf Course Hole 15: This short par four can be driven, but the green is small, undulating, and surrounded by sand, which makes longer chips relatively tough to stop on the green or near the pin if one is short-sided. Played as two shots, it's fairly straight forward fare. 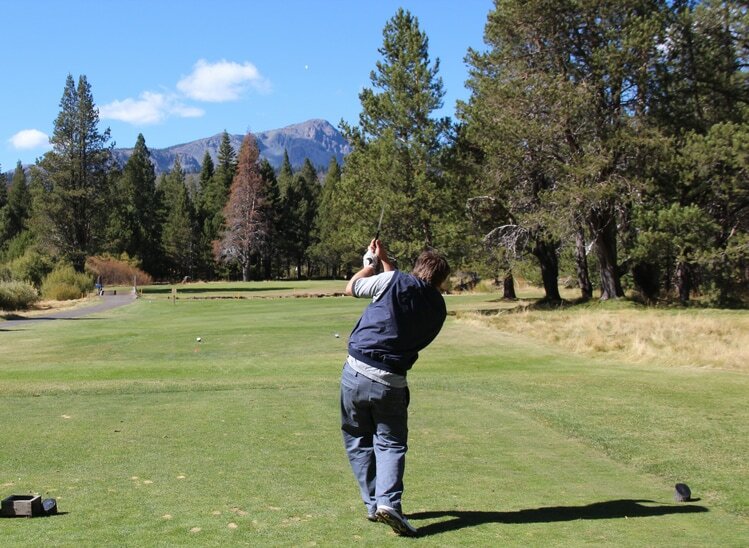 Lake Tahoe Golf Course Hole 16: Another par four between the trees, the approach here is a bit more memorable as it crosses the creek and has a green settled between the bunker short and trees long and left. 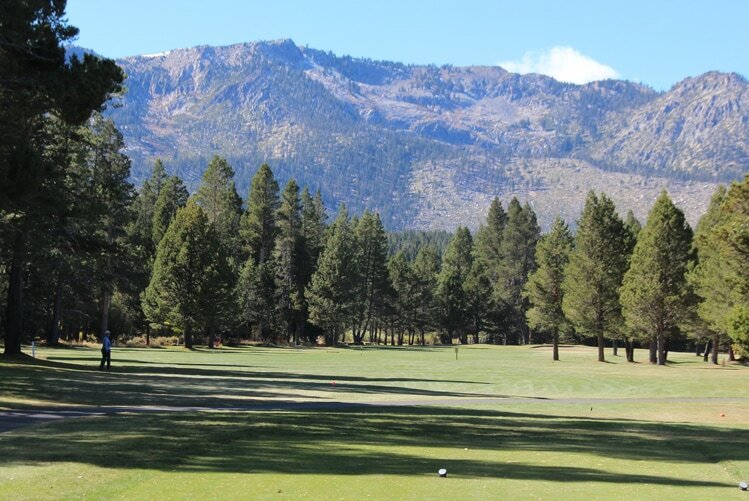 Lake Tahoe Golf Course Hole 17 (right): This short par three, pictured here from the short tees, is quite tight with trees on either side, hazard short and downhill slopes on any missed shot, so accuracy is a must. Lake Tahoe Golf Course Hole 18 (below): This par five as the creek to the left but otherwise is a bombs away effort with only a little creek to cross on the second shot.